Behavior is shaped by both genetics and experience--nature and nurture. This book synthesizes research from behavioral genetics and animal and veterinary science, bridging the gap between these fields. The objective is to show that principles of behavioral genetics have practical applications to agricultural and companion animals. The continuing domestication of animals is a complex process whose myriad impacts on animal behavior are commonly under-appreciated. Genetic factors play a significant role in both species-specific behaviors and behavioral differences exhibited by individuals in the same species. Leading authorities explore the impact of increased intensities of selection on domestic animal behavior. 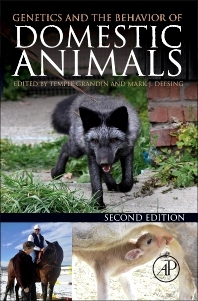 Rodents, cattle, pigs, sheep, horses, herding and guard dogs, and poultry are all included in these discussions of genetics and behavior, making this book useful to veterinarians, livestock producers, laboratory animal researchers and technicians, animal trainers and breeders, and any researcher interested in animal behavior. Colorado State University, Fort Collins, U.S.A.